The modifications humans make on natural environments can affect the interactions between animals, and between the animals and the plants that inhabit in a certain place. María Florencia Miguel is a doctoral fellow of the National Scientific and Technical Research Council (CONICET) at the Instituto Argentino de Investigaciones de las Zonas Áridas (IADIZA, CONICET-UNCuyo-Gob. Mza). 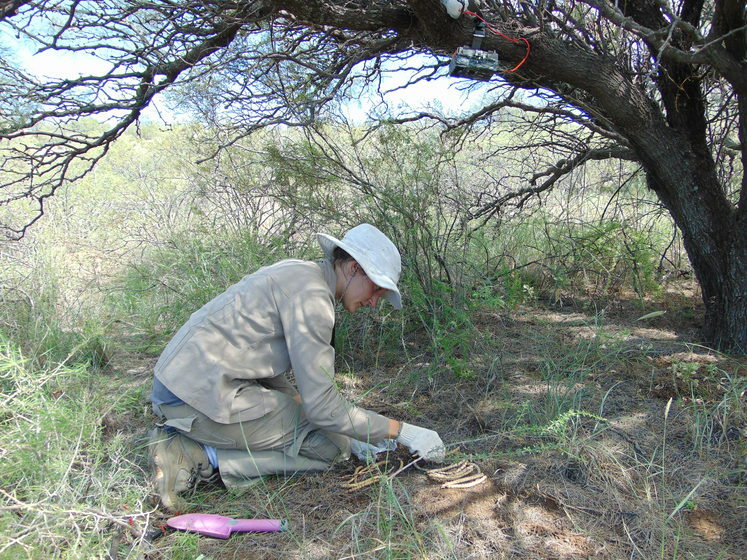 She received the Christopher Miller given by the Neotropical Grassland Conservancy in the USA for her study on the changes of the use of the land that affect the structure of the interaction networks between frugivore animals and carob (Prosopis flexuosa). During her internship at the Integrative Ecology Group (EBD) in Sevilla, Spain, the researcher and professor Pedro Jordano analyzed interaction networks between carob and mammals in native forests of the Ñacuñán Biosphere Reserve –a protected area in Mendoza- and the nearby forests with livestock activity. “We simulated the supply of fruits in trees and used a camera trap to see which animal species visited the trees, how many visits and the amount of consumption of fruit. That information provided data to produce interaction networks at an individual level, a novelty considering that those analyses are conducted at species’ level”, explains the biologist. The study was part of her doctoral thesis led by the researchers Claudia Campos and Solana Tabeni. With an imported model of social studies –called ERGM-, which had never been used in ecological interaction network research, the scientist analyzed a group of variables that involved four scales of observation including individual attributes of carob and some characteristics of the environment. “We took into account the tree’s height, the number of fruits in the crown and on the ground, the plant structure under the tree and the heterogeneity of the areas so as to know the structure of each network and compare them among the areas with or without human intervention”, the expert described. This analysis showed differences in the interaction networks of compared zones: “The frugivores are the same, what varies is the intensity of the interaction between some species and the trees, and that differs between the protected forest and the forest in use. For instance, mutualistic specie as a cavy, which eats fruits and spread the seeds are more frequent in livestock areas. On the contrary, small rodents that feed on seeds, which are called predators in this context, visit more often the plants of the protected are”, the researcher explained. Furthermore, the study revealed that in the livestock areas the frugivore interacted more with smaller size trees. “If the tree is surrounded by other plant species, the likelihood of attracting frugivore species increases. In the area without grazing that variable is not significant”, the scientist said. “There are also differences in the structure of the networks, the number of modules that are formed. The modules are groups of nodes (carobs and mammals in this case) which interact more between themselves and less with other modules of the network. In the sites with livestock, we found that the network contains more modules than in the area without livestock”, the biologist explained. The researcher affirmed that this study is important because the results an be applied in the management of protected forests: “All these variations in the networks are related to the ways of using the soil in this forests. There are variables that act at a different level depending on the management of the system. This explains how the species interact and their consequences in key ecosystem processes such as seed dispersal”, the researcher concluded. Miguel MF, Jordano P, Tabeni S and Campos CM. (2018). Context-dependency and anthropogenic effects on individual plant-frugivore networks. Oikos. doi: 10.1111/oik.04978.